HM Energy LLC. has developed patented hardware and software applications and a reporting system engine utilizing RFID SAW technology. The Company's products are specifically designed and developed for drill pipe, and down-hole tools. They can be used for onshore drilling, offshore drilling and oilfield asset management in the oil & gas industry to uniquely record stress, pedigree, integrity, and other valuable characteristics. We not only innovate by developing technologies to better serve the industry, but we work as a one on one basis with the companies who use our products. HM Energy has had the opportunity to team up with some of the top leaders in the industry. With our top players as partners we are able to offer the best and most efficient technolgies possible. Our staff of oil field RFID drilling and project management specialists can help you develop your RFID strategy and implement it for better asset management in drilling, pipe yard, oil and gas production, and asset tracking. RFID system designs require tags, hand held readers, application software, and typically wireless communication capabilities. HM Energy LLC engineers can design RFID solutions using specialized tags, readers, and installation specifications to meet your unique needs. Our support personnel can help you tailor the hardware and software to meet your needs including integration with WITSML (wellsite information transfer standard markup language) or your existing third party applications. Our RFID+ certified staff can also assist in the evaluation and recommendation to deliver a complete RFID solution. Our solution provides an automatic and wireless method of capturing data used to calculate stress, fatigue, capacity output and pedigree of individual assets or components of equipment such as: drill collar, drill pipe, conductor pipe, surface casing, production casing, tubing, mud motors, and even drill bits. The rig reader solution can be incorporated into the derrick floor to track asset pedigree as each asset trips into and out of the hole. Fixed readers can also be used for pipe yard asset tracking management. Land and subsea drilling operations, pipe yards and other services companies can monitor the history of each drill pipe usage to determine key characteristics in real-time. 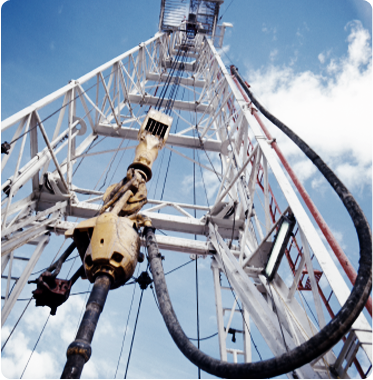 HM Energy's technology provides tracking, inventory, history and usage for all down-hole and oil and gas assets. We are the only company worldwide with a patented technology that can survive the harsh conditions down-hole.